If you live in a historic home or a home with unique architecture, you likely have an appreciation for craftsmanship and quality materials. Houses today just aren’t built the way they were years ago. Some construction materials and technologies have improved, but are often rivaled by the methods used by our grandparents. Sunrise appreciates the craftsmanship and details that went into historic windows, which is why we design our windows with these details in mind. If you are considering replacing the windows in your historic home, there are a few things to consider. Is your home on the national register of historic places? Research to learn more about the history of your home. 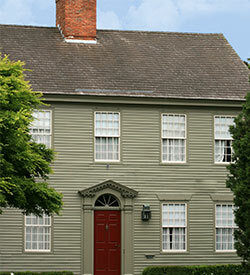 Is your home a protected historic site? Did it play a major role in your town’s history? If you are considering changing the windows in a home that is a registered historic site, you may first want to consider window restoration. There are many new technologies developed to help save historic windows, however, not every window can be saved. If your windows are beyond repair, your Sunrise dealer can help you find windows to replicate your current windows and can last a lifetime. Before you begin any remodel project, check with the local Historic Preservation Office for codes and regulations. Some restoration projects may be eligible for grants or special loans. Work with a local specialist to determine your options. Are there other ways to improve efficiency besides replacement? You may consider adding interior or exterior storm windows or window coverings to help offset the poor performance of your old windows. In some cases, this can help, but window coverings can be very expensive, and storm windows require seasonal maintenance and don’t allow for window ventilation. Weigh the costs, of both financial and time, to determine if retrofitting or replacement is the better option for your home. Will replacing my windows be a wise investment in a historic home? If your home has severely deteriorated and/or inefficient windows, it might be more cost-effective to replace them than to try to improve their energy efficiency. New, energy-efficient windows eventually pay for themselves through lower heating and cooling costs, and sometimes even lighting costs. Sunrise windows have many options to add even more beauty and character to your home to enhance the historic appeal you love. What to Expect During My Installation?